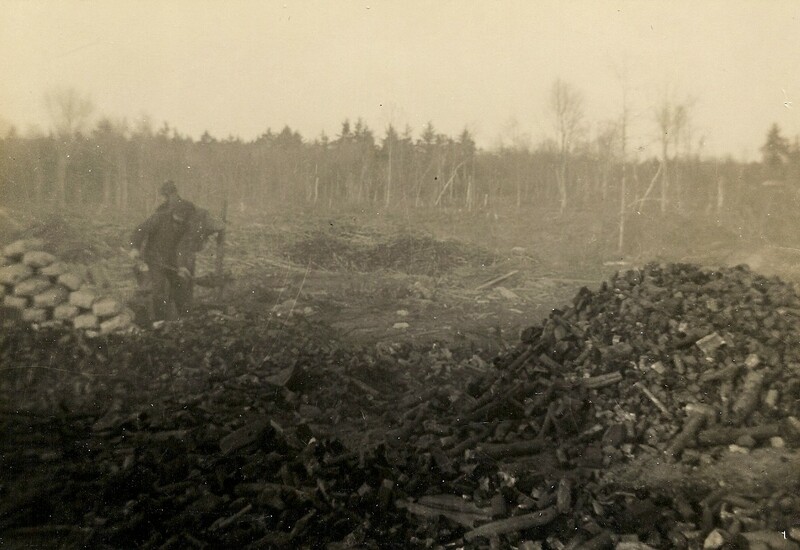 During the 1880s and early 1890s, one profitable business venture associated with the wood business undertaken on the Pratt Farm on East Main Street in Middleborough in conjunction with the sale of cordwood for heating was the manufacture and distribution of charcoal. Charcoal is believed to have been first produced by L. Brad Pratt in charcoal pits on Cedar Street, opposite the brick Jonathan Soule House, and retailed along with fuel wood during the last decades of the nineteenth century. 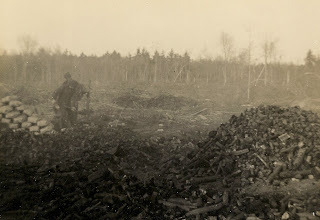 In 1920, Pratt's son Ernest S. Pratt produced a large amount of charcoal in multiple pits on the Pratt Farm. 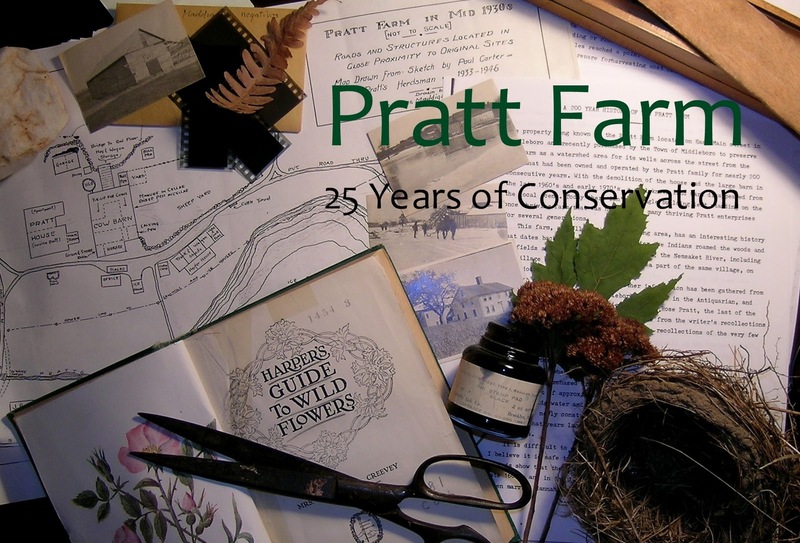 The indications of at least one of these pits remain discernible today, though the site is largely inaccessible being located in a pine grove situated in the midst of the big meadow at the rear of the present Pratt Farm Conservation Area. 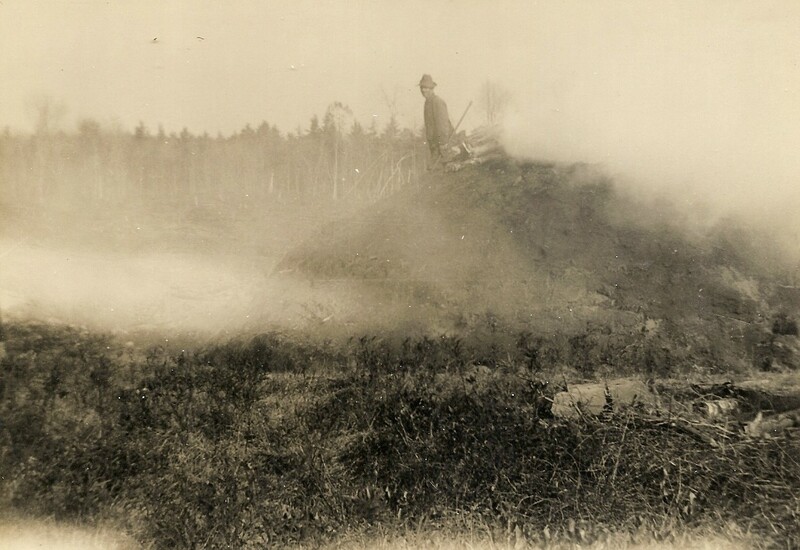 pineland for the purpose of burning several pits simultaneously, either immediately upon acquiring the land, or later that same year, about October. Once the area was cleared, the felled timber was cut into four foot lengths while a site for multiple pits was identified. All brush, roots and stumps were removed from the hearth site which was subsequently leveled. Soil was raked to the perimeter of several 30 to 40 foot diameter circles, forming mounds known as dust rings. The areas encompassed within these circles were the charcoal pits, a somewhat misleading term as the “pits’ were in fact on level ground. Pits as large as the ones built by Pratt in 1920 accommodated a few dozen cords of wood. In the center of each pit, a pole about 18 feet long known as a fagan was driven into the ground. About this a chimney was constructed, following which wood was placed laterally around the fagan and a stack built upwards. Wood was then placed in a standing position from the center of the pit outwards towards the dust ring in increasingly wider concentric circles. By the time the dust ring was reached, the pits resembled semi-spherical mounds of wood. Gaps in between pieces of wood were filled with remaining smaller pieces to make the pile as tight as possible. The chimney was then filled nearly to the top with wood chips. The pit was then leafed and dusted whereby leaves were gathered and spread covering the pit to a depth of several inches on top of which soil was spread on top. Once covered, the pits were fired by igniting the wood chips in the chimney. The purpose was to maintain a slow burn during which the gases and moisture would be removed from the wood. 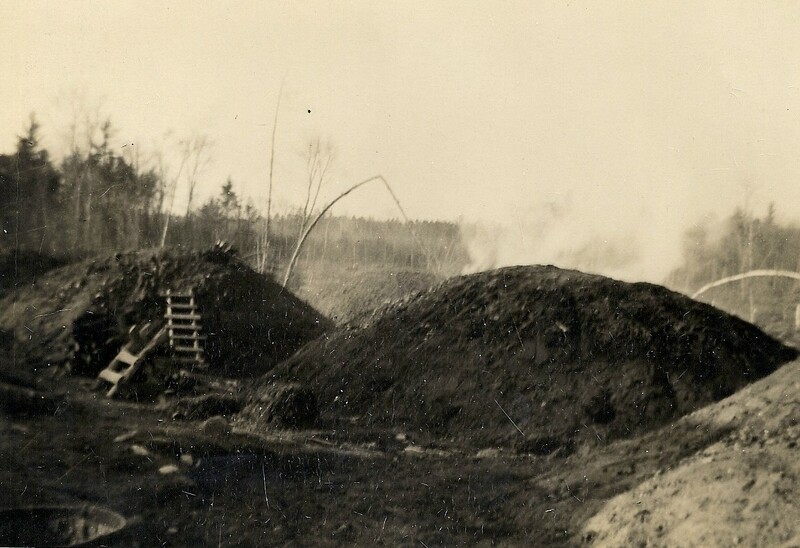 The 1920 pits were tended nearly constantly to prevent a fire from igniting on the inside and consuming the wood, transforming the wood to useless ash rather than the desired charcoal. Charcoal Pit, Pratt Farm, photograph, 1920. 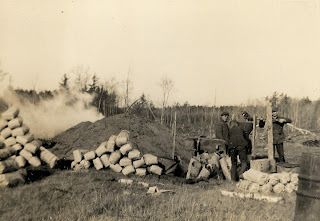 Charcoal Making, Pratt Farm, photographs, 1920. 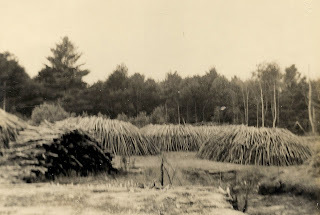 Images 2 through 5 illustrate the process of charcoal-making as conducted on the Pratt Farm in 1920. 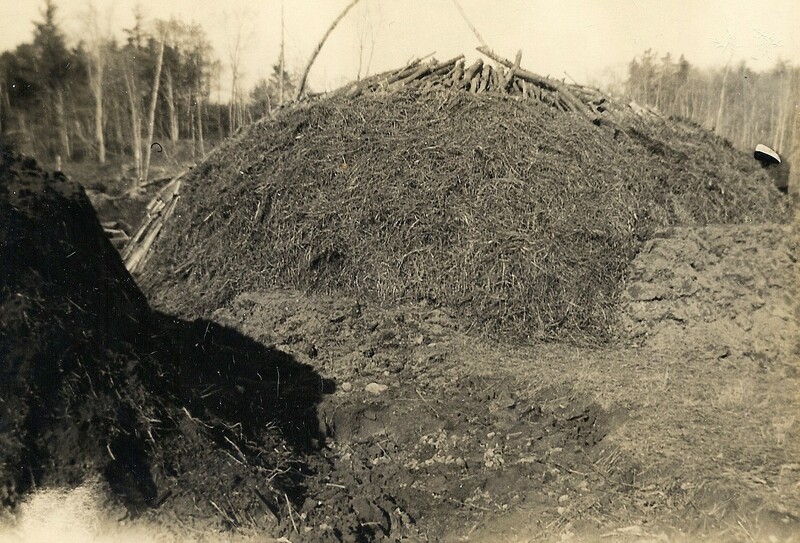 Wood is carefully stacked in several mounds or "pits" before being being "dusted" with leaves and soil. 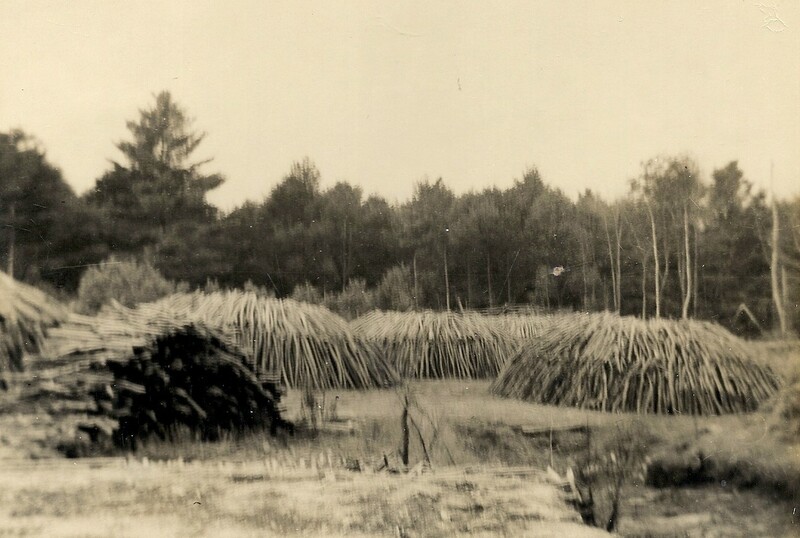 The fired pits begin to smoke, and are carefully tended to maintain a slow, even burn. Once completed, the soil is removed to uncover the charcoal beneath. 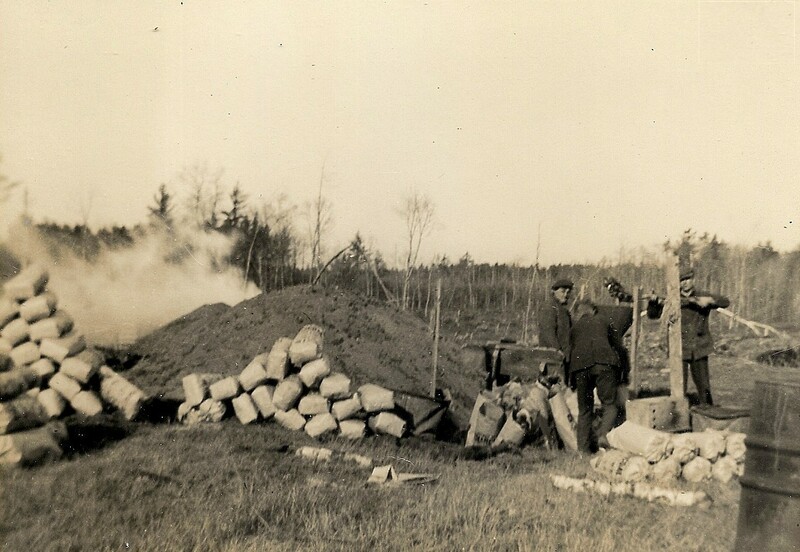 Bagging Charcoal, Pratt Farm, photograph, 1920. Once completed, charcoal was weighed and bagged for sale in heavy brown paper bags.